Battery operated (no electric cord needed). Different widths available for large and small jobs. This machine is a real time saver. And, you will get a cleaner surface than conventional methods. 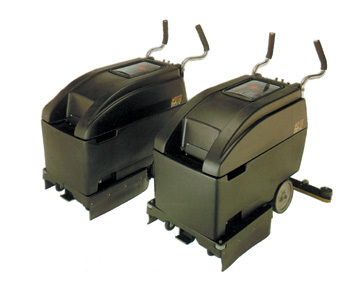 It will perform the following duties in one operation: Dispenses a liquid cleaning solution, then an on-board scrubbing wheel scrubs the floor surface; as the machine moves forward a high powered vacuum and squeegee will pickup the wet soil solution leaving the floor clean and dry behind you. All the above at a cleaning rate of approximately 10,000 square feet per hour.